Srinivas Thiruvadanthai originally joined the Jerome Levy Forecasting Center in 1998 and worked here for eight years. In 2006, he joined Kenmar, a fund of hedge funds, where he was a member of the investment committee and was responsible for guiding the firms’ top-down asset allocation strategy. While at Kenmar, he also crafted an emerging markets investment program after traveling extensively to Asia, Europe and Latin America. He rejoined the Jerome Levy Forecasting Center in 2009. 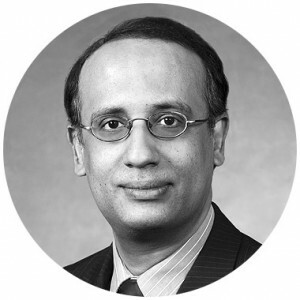 Srinivas brings a broad and critical approach to economics because of his diverse background, which includes experience in alternative investments, banking, technology, and psychology as well as economics. Srinivas has a PhD in economics from Washington University in St. Louis, an MBA from the Indian Institute of Management, and holds the CFA designation. Before coming to the United States, Srinivas spent three years as a lending officer at ICICI Bank in India. Srinivas is an avid bridge player and became the under-21 bridge champion of India in 1988 and represented India in the World Junior Bridge Championship in England in1989.